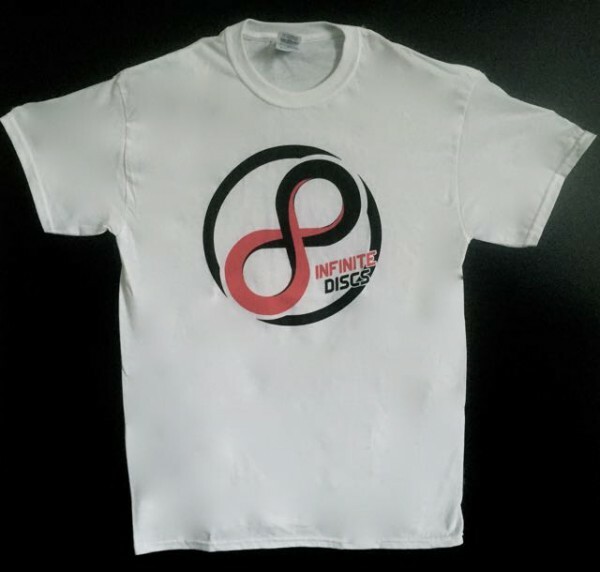 Do you want a FREE Infinite Discs T-Shirt? We’ve updated the reviews section of our website to now include user flight ratings and recommendations for beginners. To give our customers what they want, we need your help! We will be giving away 100 Free T-Shirts to disc golfers who create/update their Infinite Discs review profile (must include biography, years playing, skill level, driving distance, driving hand). If you haven’t registered on InfiniteDiscs.com you can do so here. And write (or update existing) quality reviews. The more quality reviews you write/update, the more chances you have to win! 1. 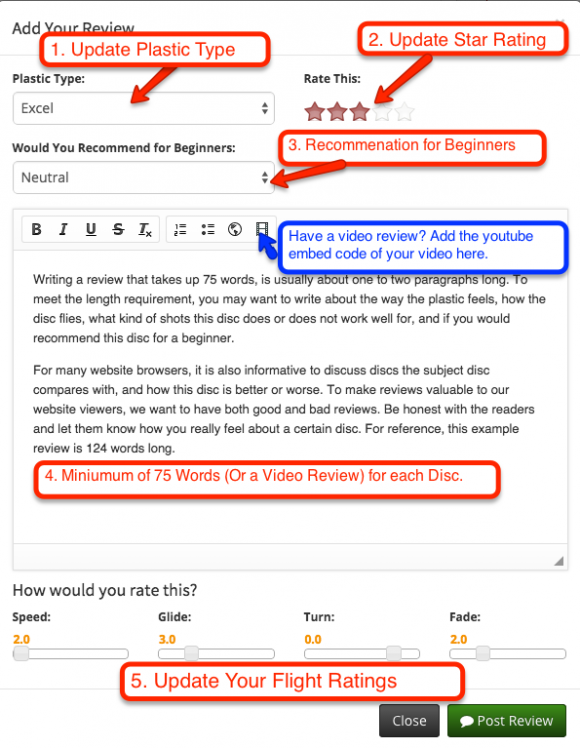 Update the plastic type (if the disc you are reviewing has more than one plastic type). 3. Update the recommendation for beginners. 4. Have a minimum of 75 words (or a video). 5. Update your flight ratings (do you think the disc flies exactly as the manufacturer said, or something different?). To get a free t-shirt, your profile and reviews must be updated by July 15th, 2015. Eligible participants will be emailed promo codes where they can order the shirt of their size on our website for Free. Any reviewer with an updated Infinite profile and at least 12 quality reviews “Review Enthusiast” (with updated flight ratings/beginner recommendations) will be automatically eligible by simply completing this form. Automatic Qualifiers (12 or more updated reviews), Redeem your Infinite T-Shirt Now! Each reviewer will only be eligible for one free T shirt. After eligibility is automatically received (12 updated reviews) or your review is randomly selected, a promo code for 99.99% off of a white Infinite Discs cotton T-Shirt will be emailed to you, where you can then make the order and select your size. Offer is good until 100 shirts are redeemed, or July 15th, 2015. If 100 people automatically qualify before July 15th, there will be no random drawing.This offer does not include free shipping on the shirt, unless you combine your t-shirt with an order that qualifies for free shipping. If you redeem only the free shirt, the shipping cost is $2.56 within the United States. International shipping costs are more expensive and vary by country. 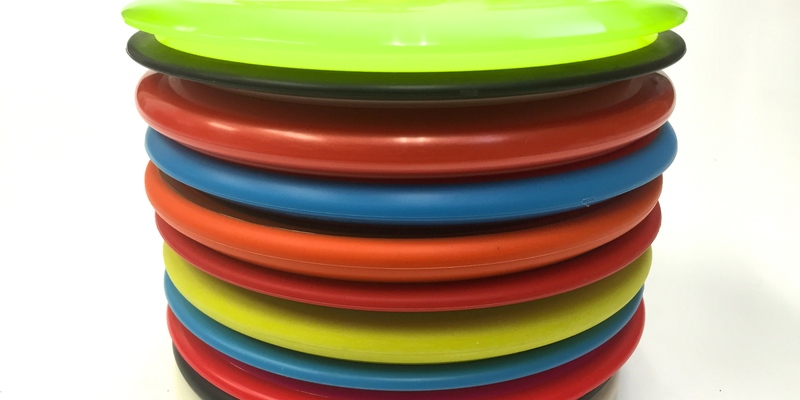 As the disc golf world continues to grow, so do the number of new disc models. Last year there were more than 70 new disc models introduced by more than a dozen different disc manufacturers. If historic disc manufacturing trends continue, this number will only increase this year. From PDGA approval and promotional releases, we know that Innova will release a putter the Whale, the Colt, and the new midrange (VRoc). There is also rumor of a really beefy putter the Innova Hawg, which may be like or replace the Pig. Innova has also mentioned that there will actually be three different VRoc versions released throughout the year. On January 16th Innova will release there new Wombat Midrange. This disc is said to be very similar to the Foxbat, but with “VTech” technology that makes it less likely to turn over. We haven’t heard any news about new releases coming out from Discraft, other than lots of new plastic varieties as limited edition fundraiser discs for the Ledgestone Open. There will of course be a new release for the Discraft Ace Race this fall. Many disc golfers are hoping that this year the Ace Race disc will be either a putter or a midrange. Latitude 64 has already released a new ultra high speed driver, the Ballista, in the new Snow Line plastic. The catch with this new release that it is only available as a limited fundraiser for the Scandanavian Open. Word is that the Ballista won’t be available at retail prices in the United States until 2016. As part of the Trilogy Challenge, a Latitude 64 putter called the Macana will be released. This new disc will initially be available in Latitude’s new baseline retro plastic. From the Disc Golf Answer Man podcast we learned that Dynamic Discs plans to release four new discs in 2015, plus the “Evidence” which will be used as the Trilogy Challenge midrange. This includes the Breakout (understable fairway driver), Justice (overstable midrange), and Convict (Overstable fairway driver). Another new release that will be available in May for those who play in the Trilogy challenge is the Sampo driver. This disc will be released in the new ultra flexible Elasto plastic. Vibram has been working on a new fairway driver the “Valley“. It seems as if development of a new fairway driver has been slower than desired, because they were not able to release it prior to the annual Birdie Bash. The Valley will be released at the end of June. In 2015 MVP has already released a very highly rated new putter (Atom) in a new baseline plastic. They have also introduced the new Plasma plastic for their Ion putter. As seen in the video, MVP is planning to release four new drivers that will have thicker rims and be even faster than the new drivers they released in 2014. The names of the new MVP drivers are listed below. The Axiom family manufactured by MVP continue to spit out new plastic at an impressive rate. Not only will there be new MVP distance drivers, but MVP has announced that there will be four new 2.0 cm Axiom drivers this year: The Fireball, Wrath, Insanity, and Virus. It will be interesting to see how different these discs will be from the Motion, Tesla, Inertia, and Impulse. Legacy has shared on its Facebook page that it has plans for four new discs in 2015: The Enemy, Hunter, Prowler, and Nemesis. The first released in this batch will likely be a new putter, probably the Prowler, as Sarah Hokum hinted during a podcast on Smashboxx TV. The Prowler will be a beaded putter with a round edge. The Hunter is a very straight flying putt and approach disc. While we’re not sure exactly sure what the drivers will be like, the Nemesis is a slightly understable high speed driver and the Enemy will should be a very overstable control driver. Gateway has two new putt and approach discs, the Warspear and the Devil Hawk. These are unique overstable putters with a thumb track on top. The Warspear and the Devil Hawk have not yet been PDGA approved. DGA has announced the release of its new putter the “Steady” because they have so much respect for Steady Ed Headrick, this beaded putter is supposed to be a really good one. DGA will also release the Hellfire, an overstable driver. Reptilian is a new disc golf company that had its first disc the “Scale” PDGA approved at the end of last year. What other new discs are expected for 2015 that we have missed? If money could talk, it would tell you that the best disc golf discs are those that are purchased the most. While we can’t guarantee that these are indeed the best discs for you, these were our top selling discs in the fourth quarter of 2014. Disc sale statistics used to determine the top discs include online purchases from all 50 states, as well as Canada, Sweden, Finland, Norway, and Germany. 1. New discs tend to sell better. People like to try new discs, even if they might not actually be any better than their current discs. 2. During the holidays we had a several sales and promotions. Discs that are “on sale” tend to sell more than those that are not. Our top 10 discs last quarter include a handful of the perennial top sellers, as well as a couple hot new discs especially popular among brand fanatics. While distance drivers are by far the most popular disc type sold, the top 10 includes a good selection of putters, midrange, fairway drivers, and the most popular midrange in the world. Innova manufactures three of the top 10 selling discs. Also represented are Gateway, Legacy, Latitude 64, Dynamic Discs, and up and coming MVP/Axiom. 1. Discraft Buzzz – The Buzzz has always been our top selling disc at Infinite Discs. It is no surprise that this popular midrange is still #1. This disc is available in a dozen different plastic types with the most popular being the Elite Z Buzzz. 2. Gateway Wizard. – It’s also no surprise that the Wizard came in at #2. While the Buzzz has consistently been the number #1 mid, the Wizard has consistently been the #1 putter. Super Stupid Soft was the most popular of the 11 different Wizard plastic variations we carry. 3. Axiom Envy – The Envy is a colorful new disc that was initially released by Axiom Discs at the beginning of 2014. This putt and approach disc is especially popular as a driving putter. While Envy sales were consistently strong all year long, fourth quarter sales really exploded with the release of the Envy in Neutron Soft plastic. 4. Legacy Outlaw – For Legacy fans, the Outlaw was one of the most anticipated disc releases we have ever seen. We had regular inquiries about this disc that began almost a year before it was actually available. This stable distance driver available in Icon plastic is said to be Legacy’s answer to the popular Innova Destroyer. 5. Innova Destroyer – The Destroyer is by no means a new disc, nor is it one of the fastest discs currently available, but this distance driver continually sells well. The Destroyer is most popular in Star plastic. 6. Latitude 64 Saint – Disc golfers are always looking to get more distance. While speed does not always translate into distance, the Saints glide rating of 7, keeps the attention of the disc buyer. The Saint is consistently a top seller that is most popular in premium Gold Line plastic. 7. Innova Thunderbird – The Thunderbird was Innova’s hottest new release of 2014. It’s fourth quarter sales were enhanced by its availability as a Halloween edition disc, and its recent release in Champion plastic. It also doesn’t hurt that 3 Time world champion Paul McBeth regularily throws this control driver. 8. Innova Aviar – Because there are so many different variations of the Aviar, it’s hard to really classify the Aviar as one disc. Enhanced by the release of some special edition Aviars at the end of the year, this popular putt and approach disc made the top 10. 9. Dynamic Discs Judge – 2013’s All Things Disc Golf disc of the year continues to be popular in 2015. With increased options, now available in seven different plastic varieties, including the new Fluid blend, the Judge was a hot item at the end of last year. 10. Innova TeeBird – The TeeBird continues to be the standard for disc comparisons. When people talk about new discs to be released, they always compare with the TeeBird. Even though this disc is more than a decade old, it is still one of the best discs and a top 10 seller on InfiniteDiscs.com. Champion was the plastic of choice for customers who purchased the TeeBird. 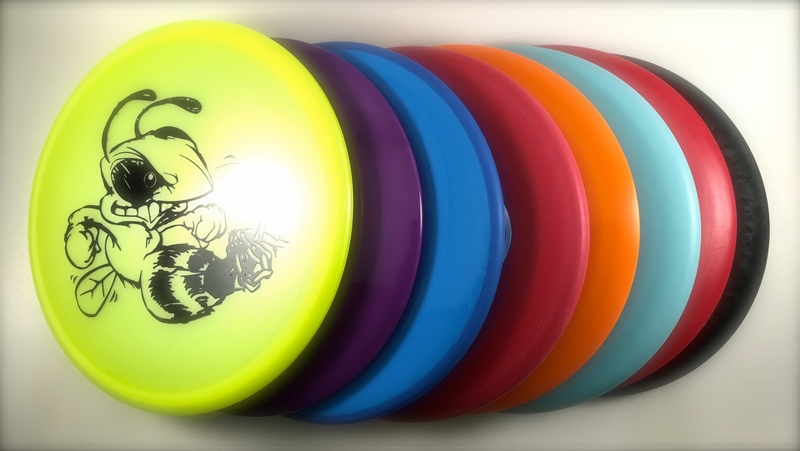 Throughout January we will be featuring some of the most popular and best selling disc golf product every day. The day that each disc is featured there will be a 20% discount code available for anyone who wants to buy the featured disc. That discount code will be published on our announcement for the disc on social media. In addition to the huge discount (off of our already lowest prices), there will be a $10 Infinite Discs gift card awarded daily! 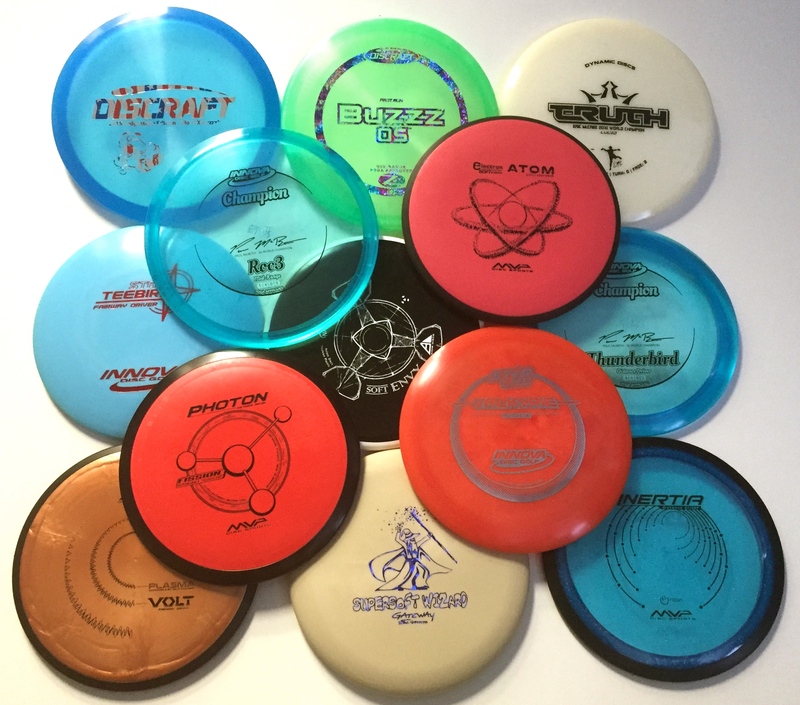 Disc reviewers are eligible to win these discs. To find out what the featured discs are each day, make sure you follow us on Facebook, Twitter, Google +, or all three. When will the featured product be announced? You’ll find the featured product on our Facebook page at 6am, Eastern every day. You won’t know which disc will be featured, and they will be featured only until midnight of the day they are announced. Increase your odds of winning gift cards by writing reviews on all the discs you have thrown. Let us know: Which disc are you hoping will be featured?